NAI The Dunham Group is pleased to announce that the Portland City Council unanimously approved the contract to sell the City-owned 1.1± acre parcel of land located at 0 Hancock Street to Jonathan Cohen of 0 Hancock Street LLC. The developer has an agreement to lease a new 100,000 square foot glass headquarters building to WEX, Inc.
Cohen is in the early permitting stages for the project with the City of Portland. Pending final permits, the developer intends to break ground this Fall with building completion scheduled for early 2019. Tom Moulton and Katie Millett of NAI The Dunham Group are representing the developer and Charlie Craig of NAI The Dunham Group is representing WEX, Inc. 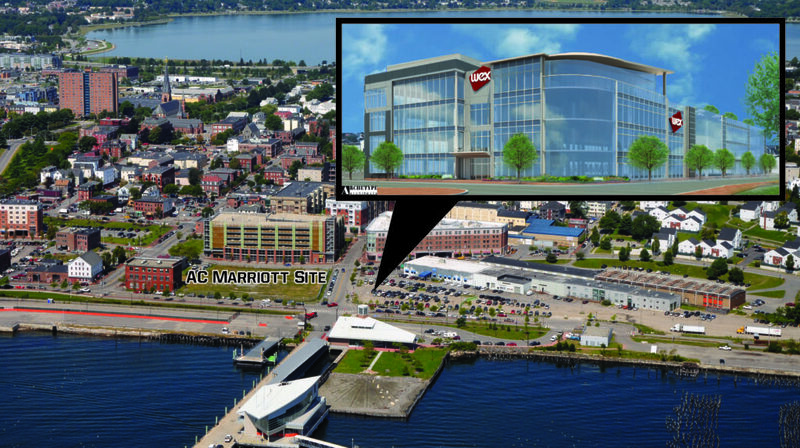 According to Craig, “This is a wonderful opportunity for WEX to occupy a state-of-the-art headquarters along the Portland waterfront. This project has many benefits to the City, including real estate tax revenues, residential, retail and hotel spending in Downtown Portland, and a landmark global headquarters office building that will act as a catalyst for future development in the area. It will also enhance Portland’s reputation as a vibrant, tech-friendly city. A shared vision of this potential was critical in bringing this project to fruition”.